How nice would it be to zip to the local market and whip out your automobile key to pay for your purchases? Or, use the same key along with a cell phone to locate your car that you parked a few hours ago in that massive shopping mall parking lot? Automaker BMW is proving that these and other great conveniences can elevate the car key to new heights – perhaps a new payment industry buzzword is emerging … top of pocket. Keyless entry, based on long-range RFID, has been around for many years, but BMW is taking that keyless entry fob to what some think is its next logical step, the key as a payment mechanism. 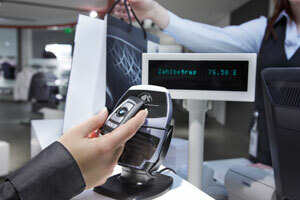 It seems that credit cards, fobs and watches no longer have a lock on contactless technology. BMW wants to “improve and optimize the comfort” of its customers, says Unrich Arendts of BMW Group in Germany. The company, in conjunction with semiconductor maker NXP, developed a prototype it calls a “smart key” that can be used for purchases wherever contactless payments are accepted. BMW assumed a lead role in development and “suppliers are supporting and enabling us to build the first prototypes,” Arendts says. “It’s a business decision from BMW as to when it will be implemented,” says Francois Patrice, director of marketing for smart cards with NXP Semiconductors, a company that worked with BMW on the trial. But it does more than pay for gas or open and start your car. “You can pay for parking or you can use it to pay at the subway as long as contactless is accepted,” says Patrice. There are other advantages to the smart key, including the capability to link to one’s NFC-compliant cell phone. “Your key can integrate data from the car, remembering where the car is parked. Three days later, if you want to find your car, you can use the key’s localization technology which can communicate to your phone and tell you where your car is and, if your phone has GPS, the phone can lead you to where your car is,” says Patrice. 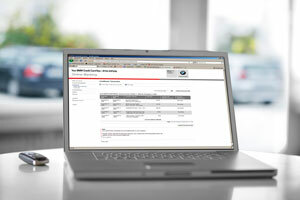 Future consumers could also be able to gain access to personal data and be authorized for personalized in-vehicle online services in any BMW vehicle that they own or drive. The personal credit card key could also be temporarily registered with other cars. Renting or sharing cars becomes more convenient, even more as personalized authorizations and service settings can be automatically activated in these vehicles.